Know someone who is starting to explore cooking for themselves? Have a pal who has good taste but no time? Want to customize your own cooking? 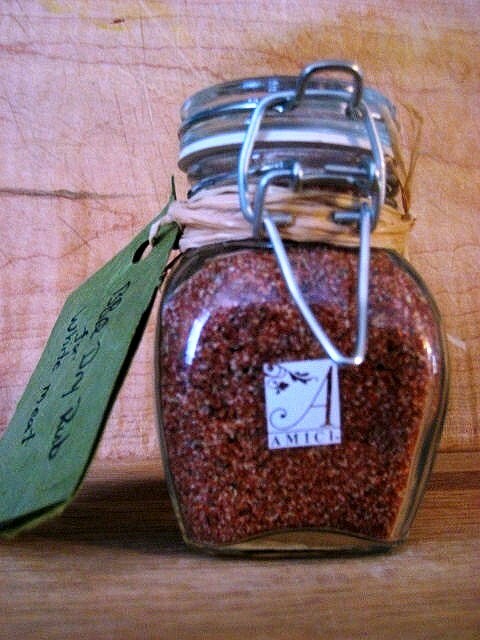 Spice blends are fun to make and with a little creative packaging make wonderful and affordable homemade gifts for any occasion. The following recipes are extra simple, totally delicious, and make perfect gifts for just about any occasion: housewarming, hostess gifts, birthday, holiday, thank you’s, the list is endless. A little hint: Make twice as much because you’ll definitely want to keep some for yourself! Caribbean Jerk Seasoning: Combine 2 tablespoons dried minced onion; 1.5 teaspoons dried thyme; 2 teaspoons ground allspice; 2 teaspoons ground black pepper, 1/2 teaspoon ground cinnamon; 1/2 teaspoon cayenne pepper. Coat or brush meat or vegetables with vegetable or olive oil. Rub mix onto the meat or vegetables. Cook as instructed (adapted from allrecipes.com). Spanish Rub: Combine 6 tablespoons smoked paprika; 3 tablespoons each regular paprika, dried cilantro, and coarse salt. 1 tablespoon ground, dried lemon peel and 1.5 teaspoons freshly ground pepper. Try it on pork chops, tenderloin or shrimp. Tuscan Spice Rub: Grind 1 tablespoon fennel seeds in a spice grinder or mortar and pestle until coarsely ground. Combine with 6 tablespoons dried basil; 3 tablespoons each dried rosemary and dried oregano. Try it on boneless, skinless chicken thighs, salmon steaks or lamb chops. Indian Spice Rub: Combine 6 tablespoons curry powder; 3 tablespoons coarse salt, 4 teaspoons crushed red pepper; 1 tablespoon each ground cumin, ground coriander, and dried mint; 2 teaspoons each of turmeric and ground ginger. Try it on tofu, chicken breast or with sauteed potatoes. Pumpkin Pie Spice Blend: Go here to read three variations. It’s also an undercover agent as apple pie spice. Clean Eating Sausage Seasoning: Go here for two breakfast sausage mixes and one for Italian sausage. Source: “From Our Test Kitchen Techniques” In Eating Well. Nov./Dec. 2008. Volume 7, Number 6, page 96. Mexican Cocoa Mix: Ingredients: 1 cup packed light brown sugar; 1 cup cocoa powder; 1/2 cup nonfat dry powdered milk; 1/2 cup plain nondairy powdered creamer (non lowfat); 1 tab (approx. 3 1/4 oz.) Mexican chocolate, grated or finally chopped; 1 tablespoon ground cinnamon, 1 teaspoon chili powder (optional); 2 teaspoons kosher salt; 12 cinnamon sticks for garnish (cassia is fine). What to do: Combine brown sugar, cocoa powder, powdered milk, powdered creamer, chocolate, cinnamon, chili powder and salt in a large bowl. For a single serving, scoop about 2-3 tablespoons (adjust for richness) of the mix into a mug and pour 1 cup boiling water over it. Stir until chocolate has melted and the mixture is smooth. Garnish with a cinnamon stick serve immediately. Makes12 servings. Source: Democrat & Chronicle, 2007. Dec. 04, Sect. C. Recipe adapted from Hot Chocolate (Harvard Common Press).